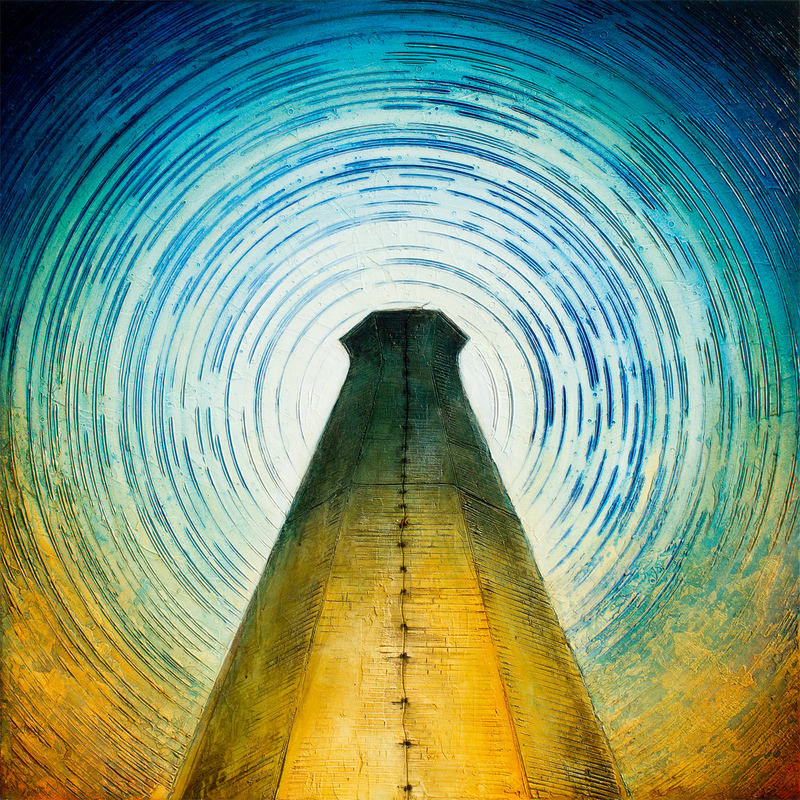 Connecting the heavens to the earth, the disused chimney stack of the Laing Tannery district is an impressive sight familiar to the residents of Kitchener Waterloo for a century. Lit from below by the urban light pollution, the contrasting star trails wheel above as if to sternly remind us that even as we redevelop and repurpose the structures of our industrial ecosystems, deep-time silences the sounds of all our works. After a century of a physical industrial ecology, the region is repurposing historic structures for the new information age. The chimney is mute a reminder that the future is defined and constrained by what comes before. We are always fated to build on the monuments of our founders. Larger image. Private collection of Brent Lintner. This entry was posted on Wednesday, October 31st, 2012 at 9:11 pm and is filed under Interrupted Horizons, Landscapes, Paintings. You can follow any responses to this entry through the RSS 2.0 feed. You can leave a response, or trackback from your own site. PREVIOUS: Guelph Lake—this road we’re on. NEXT: Nemo—20,000 fields beneath the lee.